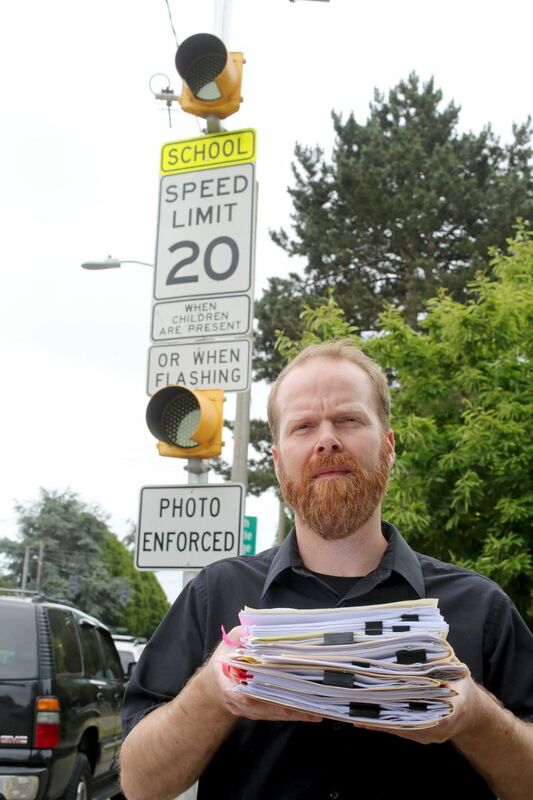 Seattle school zones display one sign too many, a judge agreed in dismissing a driver’s camera-generated $234 speeding ticket. For the second time, a judge has tossed out a camera-generated speeding ticket by ruling that Seattle’s school-zone signs are too wordy. The city mailed Jason Canfield a $234 citation in May 2016 for driving 28 mph on Delridge Way Southwest, when flashing amber lights imposed a 20 mph limit. Seattle Municipal Court upheld the fine. But he took the case to King County Superior Court, acting as his own attorney. • City signs say the 20 mph limit applies “WHEN CHILDREN ARE PRESENT” “OR WHEN FLASHING.” But national standards prescribe only one such small sign, not both — so drivers can react faster. • Though the city argued its signs are in “substantial compliance” with national guidance, Washington state code requires they match the examples and regulations in the federal Manual on Uniform Traffic Control Devices (MUTCD). Canfield, who works in juvenile probation, was driving south and looking for a client’s apartment along Delridge, then a 35 mph corridor. Canfield says he saw the flashers too late to decelerate to 20 mph. The time was 9:14 a.m., or 21 minutes before the start of class at Louisa Boren STEM K-8 school. He recalls seeing no children along the street. Officials at SDOT won’t yet say whether they plan to alter or remove any signs. Speed cameras exist across the country. Seattle has gradually installed them at 14 schools since late 2012. They’re part of the Vision Zero campaign, in which 27 U.S. cities have pledged to eliminate traffic deaths, by 2030 in the case of Seattle and Bellevue. “Photo enforcement is effective at reducing the higher-speed driving in those areas,” said Dr. Beth Ebel, director of the Harborview Injury Prevention & Research Center. Lower speeds are based on physics. Someone hit at 20 mph has a 95 percent chance of survival, which falls to 60 percent at 30 mph and 20 percent when hit at 40 mph, according to the National Highway Traffic Safety Administration. “’What you’re buying is survival for people. You’re also buying more time, to avoid hitting anyone at all,” Ebell said. A total of 28 cities and counties in Washington state operate or have used automated cameras to enforce speed limits, red lights, or both, says the Municipal Research and Services Center. By ordinance, Seattle school-camera fines are reinvested into school-area safety improvements such as sidewalks, trails, stairways, signals and education. Seattle collected $8.2 million last year, of which $5.9 million remained for safety projects after payment to a camera contractor and other operating costs. Twelve additional schools are being studied for possible camera-enforcement next year. At the first four schools (Olympic View, Broadview-Thompson, Thurgood Marshall and Gatewood), citation totals declined 62 percent from 47,348 in 2013 to 18,024 this past year. That’s proof drivers are getting the message to slow down, a city report says. In the three years before speed cameras, there were 21 collisions during school start and end times next to the 14 schools. Only six collisions happened in the 18 to 36 months since cameras arrived, according to city data. Most were between vehicles, while crashes into bicyclists and pedestrians declined from two to zero. Traffic collisions claim about 20 lives per year in Seattle. Among pedestrians, there were six deaths and 59 serious injuries this past year, according to data the state forwarded to The Seattle Times. Bellevue’s Vision Zero program reports five serious pedestrian injuries and one death last year. Canfield’s case, ruled on last month, resembles the 2014 win by Joe Hunt, who got his speed-camera ticket on Greenwood Avenue North canceled by arguing that signs marked “WHEN LIGHTS ARE FLASHING” contained too many words, and violated the manual. The city subsequently replaced signs at four schools to say “WHEN FLASHING,” the norm in other Washington cities. But placards remained that say, “OR WHEN CHILDREN ARE PRESENT,” which Canfield just challenged. Hunt’s win inspired another driver, Nicholas Boone, to file a class-action lawsuit seeking refunds for drivers like Hunt. As many as 70,000 motorists were fined up to $10 million in four school-camera zones from December 2012 to May 2014. The city won that case in superior court and an appeal is pending. However, the city attorney’s office called the Canfield case a routine matter. The ruling “concludes the case and dismisses Mr. Canfield’s ticket; the ruling is not binding on anyone else,” a spokeswoman said. Canfield uncovered an interesting twist in the law: the word “CHILDREN” was shorthand for schoolchildren. Therefore, that second sign is redundant, if you assume that amber flashers work properly during 1½ hours per day schoolchildren might come and go to class. He spent about $800 in filing fees, records gathering, photocopies and transcription fees, or nearly four times the amount of the fine. Canfield said he’ll be satisfied if the city installs briefer signs, and simpler advance-warning signs, so drivers can avoid a $234 “gut punch” even if they’re unfamiliar with the neighborhood. “It has to be making-money, or keeping kids safe. It can’t be both,” he said. A postscript: In December, the city reduced the maximum speed on Delridge from 35 mph to 30 mph, part of an ongoing initiative to lower arterial speeds citywide. So it should be easier to get down to 20 mph, before a car meets the merciless eye of the camera.